EASY TO SPOT! 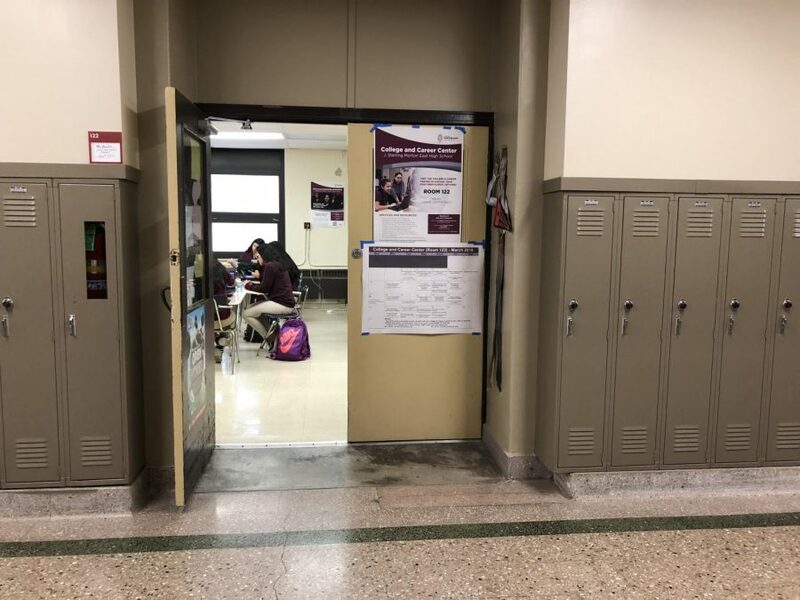 The college and career center is found right in front of the lunch room, and its various posters on the door makes it easy to find for any student who needs help with their transition into college. I think it is useful to have a college and career center in school. I think it is helpful to students having trouble applying to college or who need advice. It shows how the school is interested in helping students pursue their careers and education. I think that this article captures the reason why the school opened the college and career center. I think that it is important that students get support on their college and career choices. The college and career center is a great place to ask for advice and to figure out your place in the world. It gives students an advantage because other schools do not have this kind of opportunity. The college and career center is a highly essential feature that is offered to students in school. It allows for many first-generation students who are not educated when it comes to colleges and careers to have a resource that is close by and ready for them to use when needed. For many students, especially low-income Hispanics/Latinos there is a sense of not having a clue of what to do due to being first-generation. However, with the C and C center and with the help of people like Ms. Avila there is a sense of community in a stressful process. I think that the College and Career Center is very beneficial to Morton students as it could help them with applications, jobs, and scholarships. This is amazing as many other school aren’t offered this center, so Morton students should be very thankful. The college and career center is a great help to all the students here at Morton, having a place to go and get help for colleges, scholarships and more. I think the college and career center is great to have here at Morton because some students usually don’t know much about colleges or they don’t plan on going to college because they think that can’t go due to financial issue and more, and having the college and career center here can definitely help students learn more about how to get on their way to college.